Over 40,000 Copies Sold in the U.S. The Twelve Stages of Healing offers fascinating insights into the complete relationship between mind, emotions, and body, and shows us how we can use these insights to promote greater health in our bodies and harmony in our relationships. Have you, or someone you love, experienced . . .
A recurring sickness, healing crisis, or life-threatening illness? A feeling of emptiness and longing for no apparent reason? A major trauma, emotional hardship, or life-changing event? A feeling of being stuck in a pattern of self-destructive behavior? After observing thousands of people in both private practice and public seminars, Dr. Epstein discovered twelve basic rhythms, or stages of consciousness, shared by all humanity. 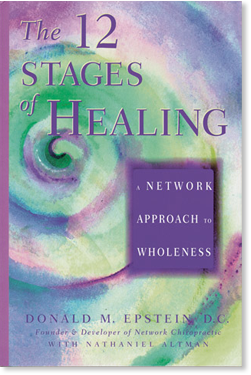 Each stage of healing has a distinct “rite of passage”— a chaotic experience or healing crisis — that helps us to reunite with aspects of ourselves that are traumatized, alienated, forgotten, abused, shamed, or unforgiven. Each stage also has a characteristic pattern of breath, movement, and touch that can help us to reconnect with the natural, internal rhythms of our body and experience a greater sense of joy and well-being. Dr. Epstein’s book takes us beyond traditional books on healing and gently guides us through the lessons of each stage on a journey toward greater wholeness, spiritual awareness, and true healing in all areas of our lives. It may appear strange to begin a book about healing with a chapter on suffering. After all, suffering is perhaps the one aspect of life that, more than anything else, we try to avoid. Yet suffering has fascinated us since the dawn of civilization and has been a central theme in our religious and literary traditions for thousands of years. The early Jews, Christians, and Muslims taught that suffering was an integral part of the human condition: if we are human, we are going to suffer. They taught that suffering is brought about by ignorance or a misconception about our true nature and is linked to wrong attitudes or actions. But they also acknowledged that suffering can lead us to seek the meaning of life and guide us to a deeper understanding of our place in the world. Suffering is also part of the Hindu and Buddhist traditions. The Buddha taught that suffering was one of the Four Noble Truths that, if properly understood, can lead to spiritual enlightenment. The Sanskrit word for suffering is duhkha, and is derived from du, “unpleasant,” and kha, the “axle-hole in a wheel,” suggesting something that is out of alignment and does not function at its full potential. Like early Western teachings, the Buddha taught that suffering was due to a lack of knowledge. It is not shameful to experience suffering. Like other aspects of the human condition, suffering exists so that we may learn to be free of ignorance and recognize our true nature as spiritual beings. Suffering is also a major theme of myths and legends. Many biblical stories are based on suffering. The escape of the Jews from Egypt, the suffering of Jesus Christ in the Garden of Gethsemane on the eve of his crucifixion (culminating with the crucifixion itself), and the often violent stories about Christian martyrs and saints all deal with intense and prolonged ordeals of suffering. Halos around the heads of individuals who became saints reflect the glory bestowed upon them for their spiritual achievements attained through suffering. The central themes of nearly all our best-loved fairy tales have to do with suffering, as well. Whether it is the tale of Cinderella (who lost her mother and endured years of abuse by her stepmother and sisters), Sleeping Beauty (who was put into a deep sleep after getting stuck with a spindle), Rapunzel (who was imprisoned for years in a tower by her jealous mother) or Beauty and the Beast (where the Beast is rejected because of his hideous appearance), all deal with the world of suffering. Many stories of suffering involve a main character being immersed in what is called “the dark night of the soul”: a time of darkness, loneliness, despair, and abandonment in an endless void from which he or she cannot escape. Often, the individual feels completely lost (a popular image in fairy tales involves a character wandering aimlessly through a dark and dangerous forest), moving deeper and deeper into the darkness. In many fairy tales and myths, the heroes and heroines are portrayed as helpless; they are totally at the mercy of forces they cannot control and are not able to free themselves from their oppression. When they enter the dark night of the soul, they become completely cut off from whatever previously existed for them. Their lives take on new dimensions with no possibility of recapturing the lives they previously led. In the minds of those suffering, the stories portray not only someone who is in pain, but someone whose soul is crying out, “Stop it! Stop it! Set me free! I can’t take it anymore!” And many who move through suffering — such as the story of Christ on the cross — feel that God has betrayed or abandoned them. These stories, as well as countless operas, plays, dances, and poems, have endured because they portray individuals — both fictional and real — who encountered suffering, became involved with their suffering, and somehow emerged from suffering victoriously. In many of these stories, ordinary people do extraordinary things in the face of physical challenge and emotional hardship. By courageously moving into their suffering and emerging through the other side, they are transformed into heroes and heroines and give hope to us all. Different from pain, suffering is marked by a profound awareness that “something is wrong.” Parts of our being have been separated from our Inner Self — the core of our being. This especially occurs when we are confronted with a traumatic or chaotic event or loss. The lesson of this stage is the acceptance that nothing works at this time; we are presently helpless. The awareness that suffering involves cycles, polarities, and patterns is the essence of this stage. It begins with the search for the “magic genie” who will save us from our distress, pain, or crisis. We try to gain power over our helplessness through external authorities, procedures, and treatments. Eventually, as we heal, we see that our genie is not so magical. We become aware of our rhythms and polarities, and discover that we are partially responsible for our distress. This stage of healing involves the recognition that our distress is associated with being stuck in a perspective. Our concepts or our physiology have been fixated. We don’t need to know why we’ve been stuck, or what to do about it. We just need to have the simple awareness that we’ve been stuck. This stage of healing is one in which we realize that the “script” determined by the above three stages is no longer desirable or no longer works. Initially, we are angry that we have lost our power and are determined not to let it happen again. As we progress through this stage, we no longer choose to dishonor ourselves. This stage is associated with having a strong enough sense of self to merge with the illusion which keeps us from our “light” or our “shadow.” With merging, the part of our nature we have alienated, disliked, or ignored is integrated into the rest of our being to create more wholeness. In Stage Six we build momentum and flexibility. The alienated, traumatized, denied or redirected consciousness or energy is being prepared for discharge and resolution. We feel the tension building within ourselves as this process advances, and find ways to create change and improve flexibility to continue the process. This stage may involve a discharge of the muscular system, such as movement of the extremities, or processes such as fever, coughing, sneezing, crying, screaming, and laughing. When the discharge occurs after the previous six stages, and a sense of accomplishment, peace, and inner strength accompanies the process, then resolution has been achieved. After the resolution and discharge we are emptied. This is not a space of nothingness, but instead a place of possibilities. We enter into a state of gratitude, vulnerability, connection with our external rhythms, and alignment with events around us. We expect serendipity to be available for us as a natural way of life. From our place of emptiness and gratitude we become aware of our fullness of light and energy. We experience that we are more than our physical body, and actually become aware of the flow of life force through and around us. We may even experience our energetic connection to others. This occurs in conjunction with awe and joy for the process. There is an awareness of Being — not as an intelligent being, but as intelligence itself; not as housing a Spirit, but as Spirit itself. We experience our union with the creative force of the Universe. We transcend all limits, boundaries, language, judgment, and our existing sense of self. We receive the gift of knowing the oneness of all creation, and gain immense wisdom during this stage. We are renewed beyond our limits and sense of self and enter into the world again. We know that we are part of all we perceive and responsible for what we know. We live without being attached to our situations. We love and serve life and others. We communicate with ourselves and others through our wounds instead of from them. We experience our involvement with humanity and recognize that wholeness comes from bringing our gifts of individuality into community. We recognize that all of our choices are spiritual ones and affect the entire globe of beings. Eventually we realize that the limits of what we can bring to community stems from our own lack of wholeness. Therefore we seek to re-experience the rhythm of the earlier stages.